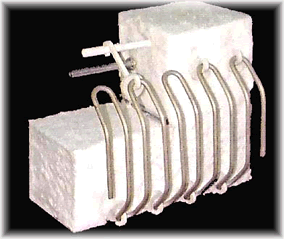 Controlling thermal excursions through reduced time base minimizing temperature extremes results in less expansion and contraction of the magnesium heater element and extends heater life. By reducing the time base on-to-on cycle time, the resistance heater can provide a smooth and even output. The power controlling device you use in your thermal system determines the severity of the thermal excursion. As time base cycling increases past one second, it becomes more damaging to the heater element. SCR's cycling at less than one second stabilizes element temperature and increases heater life. Tests have shown the reduced time base firing extends element life. SCR's extend element life by up to twenty times. 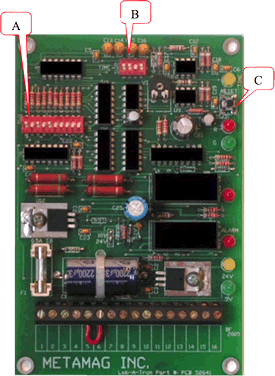 The SCR power controller is a solid state device with no moving parts to wear out or replace. While operating at the fastest time base, the SCR's are capable of many years of service. The SCR's virtually limitless life eliminates the maintenance time and cost in replacing mechanical contractors. Metamag offers two different magnesium furnace element designs. The first is our most popular rod over bend design. It offers the most economical and easy to maintain design. The rod over bend system is used mostly when space requirement does not exceed the kilowatt rating.. The Rod Over bend system is easy to maintain. There is nothing to tear out when a repair is required. The elements can be spliced together by a simple Tig welding procedure. At Metamag Inc. we contour the elements to heat around the length of the crucible, as well as the bottom where the larger surface area is usually left with a source of direct heat. The ceramic insulation module construction is unique in two ways. The magnesium insulation module is manufactured from high density ceramic material for maximum heat retention and combines the element mounting system . This compact design allows us to install the proper kilowatt rated heating system to match the melt rate requirement, while minimizing the box size. This MetaMag system is popular with maintenance personnel for its simplicity and ease. The rugged design of the elements require only minor welding repair, if any, and there is no need to change elements.